George Cole was born in South London in 1925, but was abandoned by his natural mother and adopted by the Cole family. They were not well off, and George joined the acting profession as a means of escaping a life of drudgery. This upbringing in downtown Tooting served him well – he specialised in playing the kind of character that dodges and cheats his way out of trouble or into a bit of cash. No doubt he came into contact with several people like this as he was growing up. In the 1950s, if the role called for a spiv, George Cole was called in. For a great example of this, see the 1955 film ‘Where There’s a Will’. George was 29 years old when he first played the role of Flash Harry, and he stuck with this character longer than Alastair Sim or Joyce Grenfell stuck with theirs. I get the feeling that this was more for financial reasons than dedication – he wasn’t hugely famous and handsomely paid. Every role is a gift to a jobbing actor who is worried about falling back into the poverty he once knew. In a television interview given to Michael Aspel in the 1980s, George acknowledges the direct line travelling from Flash Harry to Arthur Daley, his most famous spiv role of all. And he is on record as stating that although Arthur Daley served him well, he personally found him an abhorrent character, pitying anyone who has someone like him as a husband or father. You could say the same about Flash Harry. Flash is a funny character – as long as you don’t analyse his actions. If this sort of person was to appear on screen today, there would be questions asked. On paper, he is a sleaze - hanging around a girls’ school, selling on their contraband and arranging lucrative weddings for the sixth formers. 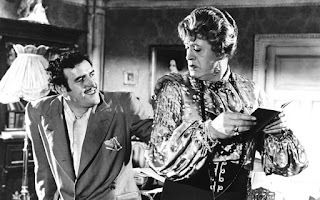 But of course, in a film from times that are considered to be more innocent and with the loveable George Cole in the part, you have to like him. When you hear that lopsided music hall tune and see the shrubbery tremble, you know you’re in for a chuckle. Come and Find me on Amazon!